We have used a plugin called Copy As HTML for years (I'm actually the current maintainer.) 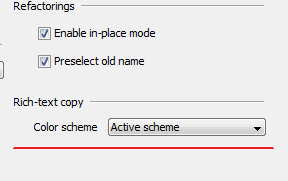 However, somewhere in the last few EAP versions my normal copy command has taken on this same functionality. I've uninstalled our plugin and the copy with formatting is definitely working. Did I miss that in the release notes? Improved and built-in "Copy On Steroids" plugin, I guess. Well, there you go. I'm just suprised I did not see that get announced.